Keeping the geese from having a successful mating season is the most humane way of controlling the population. This method of Goose Control is endorsed by both PETA and The Humane Society and approved by US Fish and Wildlife. 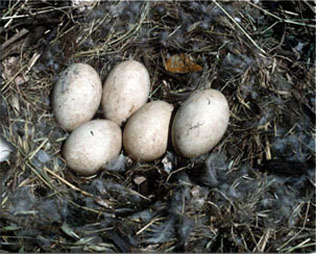 • In the spring, we intensely search for nests and note the date, number of eggs in the nest and the nest's location. • When the eggs are only a few days old we apply a thin layer of corn oil over the shell, which prohibits further development. The eggs never mature past that of a typical chicken egg found in most household refrigerators. We repeat this process as more eggs are laid. 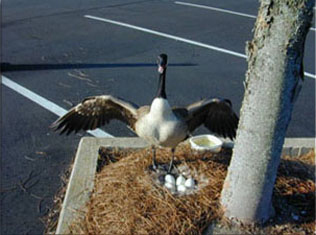 • After the female goose has been allowed to sit on the nest for a few weeks, we remove the eggs. At this point, molting has not started and both her and her mate can still fly, but it is too late for them to renest. • All geese molt (lose their flight feathers) for about 6 weeks during the summer from about mid June to the 1st of August. Our aim is to have no molting geese on your property during the summer.